The head of the Hamas-led Palestinian government has dismissed as illegal a threatened referendum on a two-state solution to the conflict with Israel. 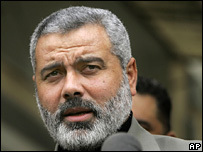 Prime Minister Ismail Haniya said the law did not permit the holding of such a poll on Palestinian soil. Palestinian leader Mahmoud Abbas wants Hamas to back the idea of a Palestinian state co-existing with Israel. On 25 May, he gave Palestinian factions 10 days to accept a plan or he said he would call a referendum on the issue. "The local basic law and the advice which we got from experts in international law say that referendums are not permitted on the Palestinian land," Mr Haniya told reporters in Gaza City. He also argued that it would be politically difficult to conduct one so soon after January's general election in which Hamas defeated Mr Abbas' Fatah faction. Talks between the two factions on the issue began a week ago. Fatah recognises Israel, but Hamas officially wants an Islamic state in Israel, the West Bank and Gaza. Mr Haniya's remarks were just the latest in a series of signs that Hamas regards the referendum idea as an effort by Fatah to subvert its electoral mandate, the BBC's Alan Johnston in Gaza City reports. Last week, Mr Abbas gave Hamas 10 days to adopt an 18-point programme agreed by various faction members jailed by Israel - or he would instigate a referendum within 40 days. The document was agreed by senior figures from Hamas, Fatah, the Popular Front for the Liberation of Palestine (PFLP) and Islamic Jihad. It sets out formal Palestinian claims to an independent state on land occupied by Israel in 1967, as well as the right of all Palestinian refugees to return to former homes inside Israel. Thousands of Palestinians left their homes following the establishment of Israel in 1948. The document calls for continued resistance within lands occupied by Israel in 1967, suggesting that attacks inside internationally-recognised Israel would end.